The EBSQ Friday Five offers a brief look at noteworthy news from around the EBSQ Artist Blogosphere. This week we are featuring Nibblefest entries and one (very cute) oddball. 1.“Jack” – Who could say no to this face? Stop by Christine’s blog and follow the links to this auction on Ebay! 2. 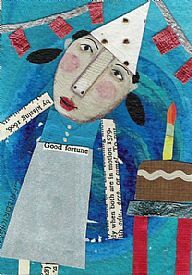 June Nibblefest Art – Artist Sherry Key has three whimsical entries to this months theme. Don’t miss out! 3. 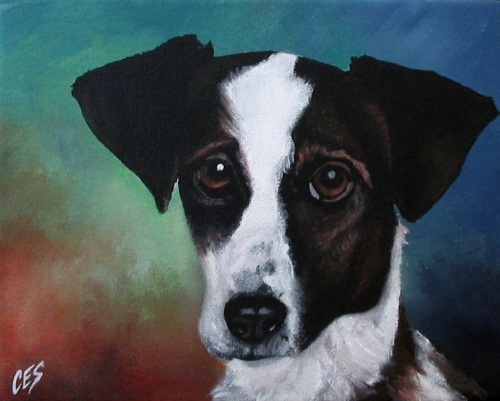 A Dog’s World – Tiffany Matthews’ entries this month are not only works of art, but also greeting cards. She needs your bids! 5. Show Me the Scampi – Whoa! What do we have here? Okay, this one isn’t a dog, but you have to take a look at this cute cat. Painted by Karen Winters for Art for Animals, a show to benefit the Pasadena Humane Society and SPCA (where they also have dogs). Have a great weekend and think about helping a pet in need! EBSQ Permanent Account Sale: This Weekend ONLY! Maybe you’re new to EBSQ. Maybe you’ve been here a while. Either way, we’d love for you to be part of our 7th anniversary celebration. We’re offering permanent (lifetime) memberships for $325 instead of the usual $650 price. Just think–no more membership fees, unlimited image hosting, access to all of the EBSQ services you already know and love (we hope! ), and uninterrupted access to our community. Your faith in EBSQ’s future will allow us to build a lot of the things on your wish list and help us as a community get that much closer to reaching our full potential. This special discount will be available starting October 5 and will run through 12:01am eastern on October 9. Thank you for believing in EBSQ and helping us further our mission to support living artists! Intrigued? Learn more about this offer at ebsqart.com! Site News7th anniversary ebsq ebsqart permanent account sale special offer woot!